By now your radon test should be coming to an end and you will soon have to send the detectors back to ourselves for laboratory analysis. 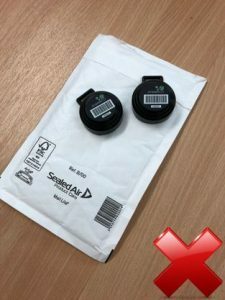 To ensure the the results we provide you with are as accurate as possible it is important that the detectors are sent back to us in the correct way. 1. Fill in all the details on the enclosed tracking form. It is vital that we know exactly where each detector was placed, including which floor of the building, and whether the tested room was part of a home or a workplace. Don’t forget to fill in the final column on the tracking form to indicate the date the test was completed. 2. Place all of the detectors in the radon proof pouches that they were originally sent out in and re-seal with sticky tape. Place the detectors and the completed tracking form in a padded envelope (or other sturdy packaging). For the most accurate results we recommend posting back on the day of completion. Please also keep a copy of the tracking form for your own records should you need to refer back to it. Don’t just pop them in an envelope. Please use the original radon proof packaging. I’ve posted the radon detectors back, what happens next ? When we receive your detectors they then undergo analysis within 48 hours by an independent laboratory. Results will be then emailed to the address provided, ordinarily within ten working days of receipt of the detectors. Our results will also include our recommendations for any mitigation that is required to reduce the radon levels in the property. Should you have any questions please call our head office team on 01606 563042 or use the feedback form on this page.